I did not really know who to root for at first. The Barbarian Horde was all kill them all! BUT they claimed that they had been attacked first. As for the people of Dara I only had Oria's opinion and she had no idea why they were attacking. Except for them being barbarians. So I was not too happy about the Destrye to be honest. And not at all when things comes to pass later on. It's not a fantasy romance, there is not an inch of romance in it. But I guess there will be in coming books. Cos duh, you read the blurb and think that they will hook up. But he keeps thinking of someone else and I am so not down with that. But then he thinks of Oria too, and I am all no you didn't! 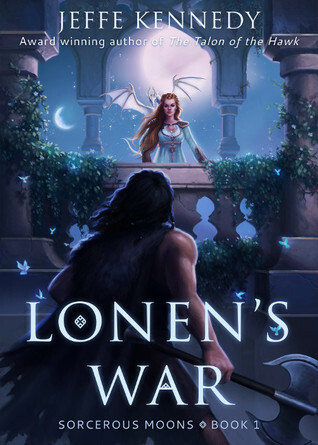 It did not really make me love Lonen. He has to prove himself in book 2 if he is gonna win me over. He does better himself, but in another way it just makes it all worse. Oh and you should see him go all but she said! Oh man, she is not the ruler of this place. Silly little Destrye. You will see. As for Oria's family, they do not show that much redeeming traits. Maybe the city really should burn. I have no idea where I am , let me see. Oria aka stuck in a cover, can't use the magic she should, never leaves said tower. And Lonen the barbarian who goes all I trust her. It was an interesting story, there are some...things I would like to learn more of. The romance part seemed utterly doomed and hope not. I'd like some romance, maybe some happy banter too.